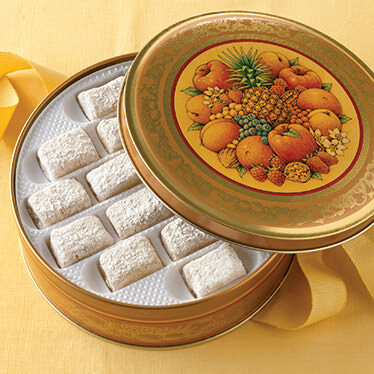 A beautiful golden gift tin filled with your choice of classic Aplets & Cotlets or Fruit Delights candies! Kosher. INGREDIENTS: Aplets & Cotlets: sugar, corn syrup, walnuts, modified corn starch, pectin (pectin, disodium diphosphate, sodium polyphosphate, dextrose, dicalcium phosphate), natural flavors, apricot purée, apple juice concentrate, sodium citrate, citric acid, malic acid, soy lecithin. INGREDIENTS: Fruit Delights: sugar, corn syrup, nutmeats (walnuts, pecans, macadamias,cashews), modified corn starch, fruit [fruit juice from concentrate (peach, strawberry, blueberry, raspberry), candied orange peel, pineapple, raspberries], pectin (pectin, disodium diphosphate, sodium polyphosphate, dextrose, dicalcium phosphate), natural flavors, sodium citrate, citric acid, malic acid, soy lecithin. 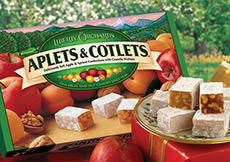 My Father is 85 and has been eating Aplets and Cotlets since he was a child. They are his favorite candy. And he doesn't really eat candy. He introduced them to me as a child and I was addicted. 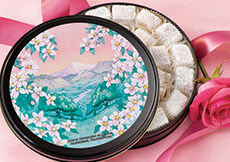 I bought this because it had Aplets and Cotlets and I wanted the beautiful Tin. I grew up in Washington State these are one of my " favorite" Childhood memories.! They are one of the few things that are still Delicious as they were when I had them as a child.